I am saddened to learn that Sifu Dan Lee, a close friend and the first LA Chinatown JKD student passed away on 15th December 2015. I am posting this interview in honour and respect of Sifu Dan Lee, and may he rest in peace and be re-united with his dear friend, Bruce Lee. Sifu Dan Lee first saw Bruce Lee at the 1964 Long Beach Internationals. At the time Dan was training Kenpo Karate with Ed Parker. Sifu Dan was the first student admitted to Bruce Lee’s new school in the Los Angeles Chinatown district in 1967. This interview was conducted in 1988. At the time Dan Lee was working at the Jet Propulsion Laboratories, and was teaching Tai Chi at Pasadena City College during his spare time. Question: What was the training program like in Chinatown? Dan Lee: Fitness was very important. Much time was spent “fine-tuning” punches and kicks. Bruce used to tell us that our punches and kicks were the “tools of the trade,” just as a hammer and nails were a carpenter’s tools. He told us that we should make every tool a masterpiece. We devoted a great deal of time to kicking the bags, and Bruce would watch us and provide a critique of our performance. His suggestions were tailored to each individual, so that each could overcome our shortcomings. He also emphasized timing and rhythm training. Occasionally, he would play music and have us study the rhythm of movement, and be able to fit into the space between the beats. Q: What characteristics or qualities did Bruce look for in his students? DL: Moral character. Bruce spent a lifetime developing this art, so he did not want to pass it on to people of dubious character. As a result, he screened students quite carefully (although he did show his art to those who did not want to train extensively with him). He looked for a willingness to train, respect for him as a teacher and sincerity. Over the years, those who were truly influenced and touched by him still uphold his name and honour his requests not to commercialize his art. DL: I saw Bruce for the first time at the Long Beach Internationals in 1964, where he was demonstrating his art. I was in awe of the speed of his punches and kicks and the power he generated, yet his movements were so graceful and fluid, and seemed effortless. I was also impressed at his confidence in conveying his art to the audience. Later on in his class, Bruce was able to convert us to see what he saw, that we were so trained and conditioned in our rigid responses that our responses were predictable. He said that after years of training in a routine and feeling comfortable in it, that he could touch us at will because he knew our rhythm and could “fit in” with it. He could penetrate us at any time. Q: What was the most difficult aspect of training? DL: During the first year, it was getting rid of all my preconditioned responses. For example, when someone threw a punch at me, I had developed a certain set of responses that were predictable. I was unaware of this until Bruce exposed me to the fact that being too comfortable with something was to my detriment. In this way, he explained, your strongest defense could be your downfall. Q: What is your fondest memory of Bruce Lee? DL: On one occasion while we were working out in Chinatown, James Lee, my senior in JKD who was visiting from Oakland, observed the class. After the session, Bruce came over to me with a smile on his face and put his hand on my shoulder. “Dan,” he said, “do you know what James said about you?” Bruce told me that James said, “You know, Bruce, that guy’s really got it.” I figured he probably felt I had trained very diligently and had a good level of timing and rhythm. I felt very honored and proud when I heard that from Bruce. Q: What concepts or principles did Bruce Lee stress? DL: What makes Bruce Lee great is that he was not only a dedicated martial artist training his body, but he was also a thinker, a philosopher. He told me once that he went to the University of Washington to major in philosophy so he could experience his martial arts through the eyes of a philosopher. To make an art unique, it must have a philosophical foundation. Bruce Lee saw his JKD principles in the Chinese Taoist philosophy, the relationship of yin and yang. It was this principle of “softness” of pliability overcoming hardness, the water principle of never clinging to one aspect, that gave substance to his art. That is the philosophy of Tai Chi, which is the one art that has endured in China, although there have been many other styles throughout the years. Bruce stressed these principles of pliability, that one should never be always on the attack, that one should also wait to sense the opponent’s energy and then counter it, like water flowing and fitting into any space. This approach is opposed to making your own strategy and attacking like a wild bull without any consideration for your opponent’s rhythm, timing, speed and size. The more I studied, the more I began to realize where Bruce’s thoughts came from. JKD really is philosophy in action. Q: Is this why you believe Tai Chi and JKD enhance each other? DL: In my own life they complement each other beautifully. Bruce emphasized feeling and emotional involvement, or combat readiness. However, one cannot have that feeling all the time; one must also find a time of repose. Through the harmonious movements of Tai Chi, I find the peace of mind and contentment that other martial arts have failed to provide. Even in my JKD, in combat, I still remain totally calm, free of anger. In this state of mind, you can remain calm and plan your strategy, even if you’ve been hit or hurt, rather than blindly retaliating. I found that this is where my interest lies: to teach people this level of centering to cope with their stressful lives. I do expose the combative elements of “yielding” to some of my advanced students who have had martial arts training. Q: What are your hopes for the future of JKD? DL: Every branch of martial arts has been influenced in some way by Bruce Lee, although Bruce would object to JKD being used in the marketplace as a label. I wish we could move on, and continually develop and flourish in the art, yet not deviate from Bruce’s guidelines. 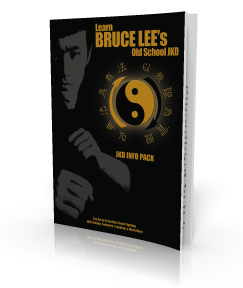 I would like to see the people who studied originally with Bruce get together at least once a year to exchange information and expound on his “Tao of Jeet Kune Do”. We could share our knowledge and experience some of these basic, underlying principles. We should have a time of rememberance for Bruce lee so that his art and philosophy will continue for the next generation and the future. Each student, based on his own inclinations, will develop according to JKD principles. I, for one, am very much influenced by the Chinese philosophy upon which Bruce built his art. I continued to study Bruce’s “Tao of Jeet Kune Do,” which was his analysis and insights into the martial way. Through Bruce we have been liberated; even though we study other arts, we must avoid meaningless drills and routines where it becomes a stylized form. This is not what Bruce was after. He said there was a process of constantly shedding techniques, that we should not be bound by drills so that we can confront a combat situation that is constantly changing. As Bruce said, “I am nothing but echo to a sound, I don’t prepare what I plan to do.” That is why I don’t believe in constant drilling in technique; it binds you and makes you more predictable in your response. In combat training, you have to train with all kinds of partners, big and small, fast and slow. What may work for one type of opponent may not be appropriate for another. Sun-Tzu said, “Know yourself and know your enemy, and you can become invincible.” Therefore, JKD is not about working a fixed technique, but rather feeling the opponent’s energy, his reactions, determining his weaknesses, then applying your particular skill to the individual. This interview originally appeared in the July 1988 issue of IKF and was conducted by Fran Joseph. About the video: Sifu Dan Lee discusses Bruce Lee’s speed and the relationship between relaxation, speed and the yin and yang as it relates to Jeet Kune Do.